Dr Simon Choppin is a research fellow at the centre, where he specialises in camera vision, high speed video and data modelling. His PhD at Sheffield University investigated tennis racket dynamics and involved working with the International Tennis Federation. In 2006 he developed a novel 3D method of racket and ball tracking, which was used at a Wimbledon qualifying tournament. His subsequent paper, presented at the Tennis Science and Technology Conference 2007, was awarded the Howard Brody Award for outstanding academic contribution. Simon is also a keen science communicator and has taken part in several high profile events promoting the image of science and technology, he was awarded a British Science Association Media Fellowship in 2009 and worked with the Guardian newspaper for four weeks. In 2011 he was awarded a fellowship with the Software Sustainability Institute. 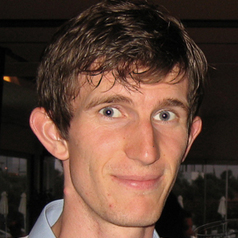 His current research focuses on the novel use of consumer depth cameras in biomechanics and he also works on a large project utilising neural network and genetic algorithm optimisation techniques. He edits and contributes to the CSER blog, Engineering Sport and is an associate editor of the Sports Engineering journal.